Two days ago my computer got super noisy; it sounded like it had a weed-eater inside of it. As it turned out, my processor fan was starting to croak. Fortunately I had ordered a spare fan several years ago, so I just needed to replace it. 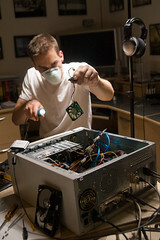 It was a bit nerve wracking to “operate” on something that close to the processor –I felt like I was performing brain surgery, and thus the concept for this photo was born. so serious! =) I am distracted by the size of your monitor! goodness, that is sweet.